You should be doing this anyway, because it increases transparency and makes it easier to make friends online. And you do want to make friends online to play games with, right? Right. This profile is still leagues behind many of Steam's cool features, both in functionality and looks and customization, but on the other hand it offers a ton of functionality that Steam lacks, and probably will forever lack considering that to even merely MENTION a competing platform on Steam is a bannable offense there. 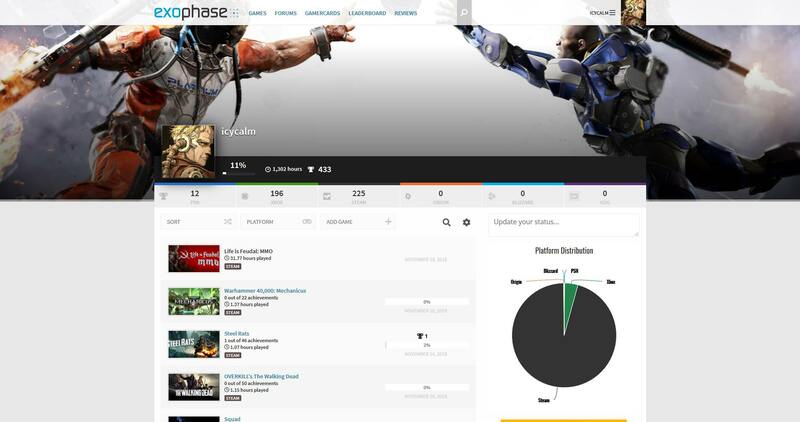 So if you want to see Exophase improve and dominate, as I do, the best you can do is make your profile there, connect all the stuff that it's possible to connect, and then come here and link your profile so the rest of us can have a look at it and marvel at your good taste and gaming prowess. And if you are cool like me, you can even enable it as your forum signature by going into "My Gamercard" and getting the BB Code and then entering it into the Signature section of your Insomnia User Control Panel [ > ]. So let's see what you got! I placed my Gamercard in my signature, not too shabby. Thankfully you don't need to supply login details to extract information from your Xbox Live account. I lost the password to that account years ago, and haven't had my credentials reset yet. My signature should be updated with my Exophase card. This is pretty dope. Here's mine. The revolving banners at the top of your profile are taken from the last few games you've played. I played Gungeon recently, and it fucks up my entire profile. Gotta play some better games to get rid of it. It's been a while since I played any PS4 games, this banner is a decent motivation to get it updated. I love seeing the full chronological order of last played dates. Steam only shows you the last few.